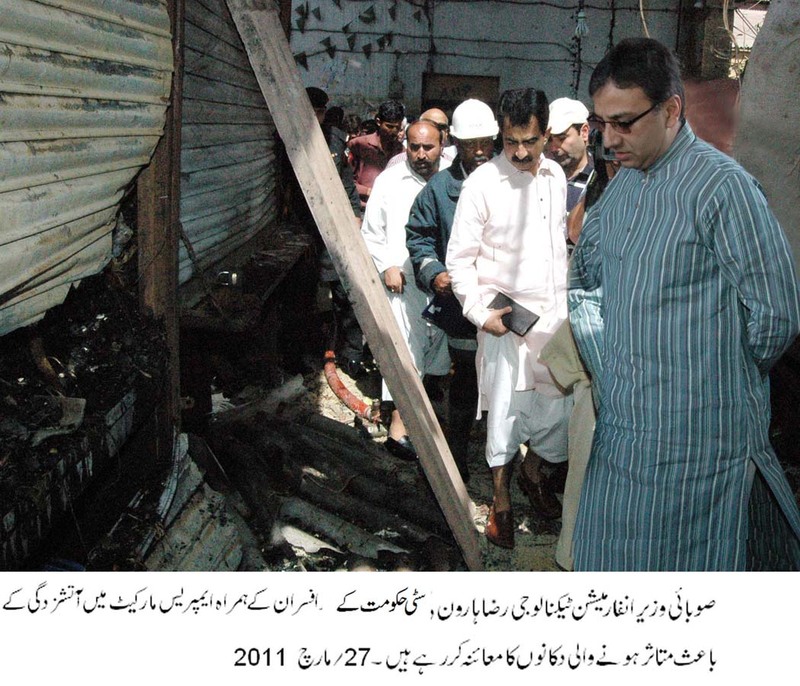 Provincial Minister for Information Technology Raza Haroon has said that 108 shops ravaged by fire in Empress Market will be restored in original condition. Financial help will be provided to affectees.Separate committees headed by EDO Revenue Roshan Ali Shaikh and EDO E&IP Dr.Saifur Rehman has been established to ascertain the reason of fire in market, losses sufferedby the shopkeepers and restoration work. He said this during a visit of theEmpress Market on Sunday. 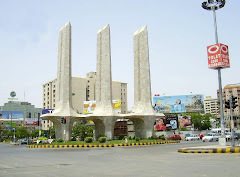 He was accompanied by Administrator Karachi Muhammad Hussain Syed, EDOs of City Government Karachi and other officers. 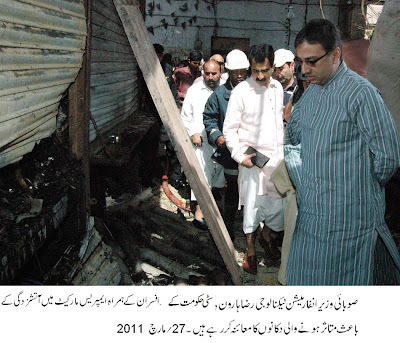 On this occasion he also met with the shopkeepers and assured all possible help to them in their early restoration. He also said that representatives of the shopkeepers will also be included in the committee which would enquire into the incident. Earlier fire brigade of city district government Karachi after getting information of the fire in Empress Market on the night intervening Saturday and Sunday took timely action and saved more than 300 shops from fire in Empress Market and adjoining markets. EDO Municipal Services Masood Alam personally monitored the fire extinguishing operation.